Join a student organization and build your leadership skills outside of the classroom. With student organizations at the O’Neill School of Public and Environmental Affairs and Indiana University, you can get more involved in your field of interest, our School, and our community. Gain work-related experience and network with your peers and potential employers—while advancing your leadership skills. We have organizations for every degree level. Can’t find your niche? Get together a group and consider creating your own organization—we can help. Networking, service projects, and social opportunities for alumni of AmeriCorps NCCC, VISTA, Teach for America, City Year, and all other AmeriCorps programs. Service projects based on the mission of preventing and alleviating human suffering in the face of emergency. Open to all IU Bloomington Students, the CNSA promotes knowledge of nonprofit concepts, philanthropy, and volunteerism with a special focus for Chinese and other international students. Open to students in all disciplines, CPMA provides professional, academic, and social opportunities involving arts, culture, policy and management. A cross-campus organization for all students that facilitates discussion on education policy topics and research, provides opportunities for peer and expert interaction, and serves as an education policy resource for the IU Bloomington Community. A professional student organization for the exchange of ideas and information related to environmental management and sustainable development. A forum for students to engage in international public affairs and policy issues, IPAA also supports students seeking careers in the field. LGMA fosters the understanding, education, and involvement in the local government profession through the coordination of exploration trips, informational panels, and educational discussions. Professional, educational, and social development for students interested in all aspects of municipal finance, both public and private sector. PFA provides a structure for interaction between students, the municipal finance community, business executives, and government officials. Encourages dialogue between international and domestic students of different cultural backgrounds to develop cultural skills to advance future careers in the increasingly international marketplace. Works to improve diversity and the cultural climate at SPEA through recruitment, retention, advocacy, and action. The world’s premier student-run international organization dedicated to increasing cultural understanding and cooperation through an international work exchange program. Training events, professional certification, publications and ongoing education for financial professionals in government. HMPSA is for any undergraduates interested in the current trends of the healthcare industry. 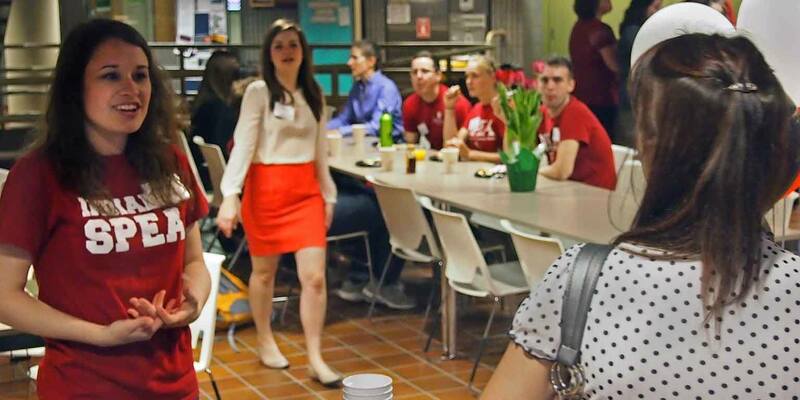 Open to all undergraduate students interested in human resources, HRA-IU provides networking and recruiting events, social events and meetings about opportunities in the HR world. For undergraduate students interested in in advancing their skills in research, argumentation, public speaking, critical thinking and listening. The premiere legal activity campus, providing a framework for members to gain a better understanding of the practice of law. Sponsored by SPEA, the College of Arts and Sciences, and the Vice Provost for Undergraduate Affairs, Model UN students travel to intercollegiate conferences to discuss international policy challenges in the role of professional diplomats Travel to one conference or join the team for your entire college career. Not just for future ambassadors, it provides career skills applicable across many fields. Benefit from our Networking Speaker Series, regional conference, and networking trips to Nashville or Chicago along with opportunities to work with local musicians. A community of students dedicated to professional development through diverse service and educational opportunities and local and national networking to become leaders in the nonprofit sector. UPSO is a nonpartisan group dedicated to giving students experience and knowledge and the opportunity to discuss issues they care about outside of class. SPEA—USO works to bring together the SPEA undergraduate student body to collectively improve the SPEA undergraduate student experience. ELSA is for all students that seek a career in the diverse and expanding energy industry. Members of Global Partners, presented by O’Neill's Volunteer and International Student Coordinators (VISC), work to support and welcome first-year international students and make O’Neill an even more inclusive environment. The student government for the O’Neill graduate student population, advocating on behalf of the students to improve their O’Neill experience. A professional membership association, NMA fosters a network of O’Neill graduate students, faculty, and professionals interested in the nonprofit sector by providing professional development opportunities. A campus-wide organization for all students who previously served as a Peace Corps volunteer. Work to plan, organize, and execute the O’Neill Auction and Gala to raise funds for O’Neill graduate students for professional development scholarships and summer internship stipends. Share your research and get writing support amidst a supportive, professional community of peers and faculty and participate in the group's annual conference. Outside of the classroom, there are many ways to get involved. Also, take advantage of service opportunities by supporting community-centered activities.